Individuals pursuing online pastoral degree paths often feel drawn to ministry in some form, with many deciding to seek roles as pastors or other Christian leaders in the church. According to data supplied by the Bureau of Labor Statistics (BLS), roles for clergy are projected to grow by 8% between 2016 and 2026, while positions for directors of religious activities and education could grow by 7% during the same time frame. Given that the Pew Research Center found seven out of every 10 Americans identify with some form of Christianity, roles for these spiritual leaders should stay in demand in the coming years. This guide offers information on common coursework, degree outcomes, and potential careers. 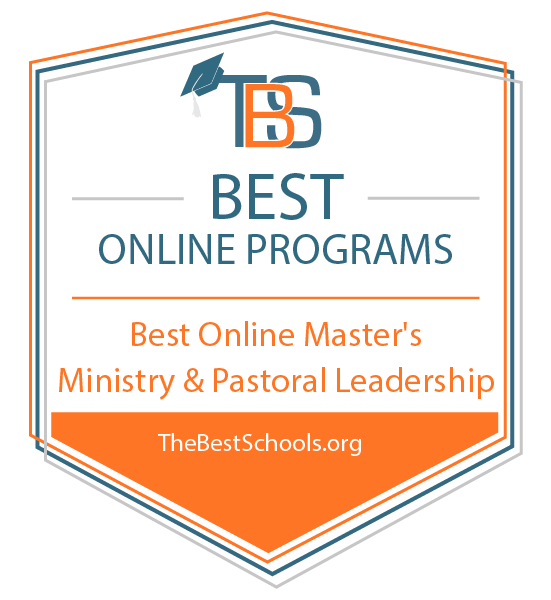 What Else Can I Expect From an Online Master's in Ministry & Pastoral Leadership Program? 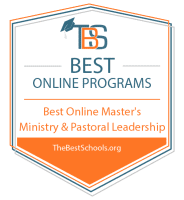 Online Master's in Ministry & Pastoral Leadership Degree Program Ranking Guidelines: We selected the degree programs based on the quality of program and range of courses provided, as well as school awards, rankings, and reputation. Located in northeast Pennsylvania near Scranton, CSU serves more than 1,200 students with programs at the associate, bachelor's, master's, and doctorate levels. A Baptist-affiliated institution, CSU offers a 30-credit master of ministry with a concentration in the Bible. Full-time students can complete the degree in as little as one year by taking eight-week courses, which do not require live class sessions. Students may also take on-campus courses to supplement their online pastoral degree curriculum. The program comprises 22 credits of required courses and eight elective credits. Courses include God's plan for the ages, principles of spiritual formation, and world ministry and the local church. Both men and women may apply, but all applicants need one year of full-time ministry experience and must currently work in ministry. CSU is regionally accredited from the Middle States Commission on Higher Education (MSCHE) and nationally by the Association for Biblical Higher Education (ABHE). A Jesuit, Roman Catholic university in Omaha, Nebraska, Creighton educates more than 8,000 students, split half-and-half between undergraduate and graduate programs. The university offers a 36-credit master of arts in ministry to equip students to serve others through the Catholic church or other Christian denominations, or through faith-based parachurch ministries. Creighton's program provides students with year-round, eight-week courses online, plus one-week, on-campus residencies in the summer. Part-time students can expect to finish the online pastoral degree in about three years. Courses include historical spiritualities in the Christian tradition, introduction to the New Testament, and ministerial ethics and leadership skills. Admission requires a bachelor's degree with a 3.0 GPA or higher, plus nine credits of theology. Students can also inquire about a distinctive dual degree option with the school's master of negotiation and conflict resolution. Owned and operated by the Baptist Missionary Association, an autonomous union of Baptist churches, and located in Jacksonville, Texas, BMATS serves about 160 students. Its master of arts in pastoral theology equips ministers serving in pastoral support roles, rather than those in ministry leadership positions. Associate pastors, lay leaders, and Bible teachers can take the 36-credit online pastoral degree over two years, focusing on biblical studies, theological studies, or pastoral studies. Courses include Old Testament theology, New Testament theology, church administration, and survey of Baptist heritage. The degree concludes with a comprehensive exam. To receive an offer of admission, prospective students must hold a bachelor's degree from an accredited school and a GPA of 2.5 or higher. Applicants may transfer up to 15 credits from another accredited institution. BMATS is regionally accredited by the Southern Association of Colleges and Schools (SACS) and nationally accredited by the Association of Theological Schools (ATS). Situated in Lithonia, Georgia, part of the Metro Atlanta area, Luther Rice serves about 1,300 students. The Southern Baptist school focuses on providing Christian leadership courses online. Luther Rice offers a 36-credit master of arts in ministry that students can finish in 18-24 months online. Students can complete the entire degree online, or they can choose a hybrid model. The curriculum centers on practical skills needed for pastoral ministry and church-based leadership. Courses include introduction to biblical hermeneutics, foundations of apologetics, and marriage and family counseling. To receive an offer of admission, applicants must hold a bachelor's degree with a GPA of 2.0 or higher. They must also affirm the school's statement of faith and take a diagnostic Bible knowledge test. Luther Rice is nationally accredited by the Association for Biblical Higher Education (ABHE) and the Transnational Association of Christian Colleges and Schools (TRACS). Affiliated with the Churches of Christ and Christian Churches and located in Fullerton, California, HIU educates more than 1,300 students both in its close-knit, on-campus community and through distance education. The university offers a master of arts in ministry, either single concentration or dual concentration option, which equips students for success in church or parachurch ministry. The 36-credit degree includes nine credits in each chosen concentration, options include worship, church planting, intercultural studies, and spiritual formation. Learners take courses such as Bible study methods and tools, Jesus and the kingdom among us, C.S. Lewis and the literature of faith, and vision casting. Students can study exclusively online, or participate in a three-day, on-campus residency. Admission requires a bachelor's degree with a 3.0 GPA, though applicants with lower GPAs may ask for consideration. HIU is regionally accredited by the Western Association of Schools and Colleges (WASC) and nationally accredited from the Association for Biblical Higher Education (ABHE). Located in Fresno, California, FPU is a ministry of the Mennonite Brethren Churches serving about 4,000 graduate and undergraduate students. The university offers an online master's degree in Christian leadership called the master of arts in ministry, leadership and culture. This 48-credit program takes three years to complete. Students study online and in weekly, 90-minute synchronous course meetings. FPU provides each student with a ministry coach, and requires both a cross-cultural component and four one-week residencies. Courses draw from biblical and theological reflection, personal and holistic formation, radical and practical application, and self-directed learning. The program concludes with a creative capstone project. Successful applicants must hold a bachelor's degree with a minimum 2.5 GPA, and submit a writing sample, letters of reference, and a personal profile. FPU is regionally accredited by the Western Association of Schools and Colleges (WASC) and nationally accredited by the Association of Theological Schools (ATS). A Baptist-affiliated school located in Cedarville, Ohio, Cedarville University educates about 4,000 students through on-campus and online undergraduate and graduate programs. The university offers an accelerated, one-year master of ministry to prepare students for vocational ministry positions or improved leadership in local church settings. This online pastoral degree blends biblical theology, leadership training, and real-world experience. Students can take courses online or on-campus, full- or part-time. Courses include trinitarian implications for practical ministry, contemporary theology in historical context, and ministry of teaching and preaching. Each semester, learners meet one-on-one with their program directors for prayer and discussion. Students conclude the program with a robust internship experience, which serves as the capstone. Applicants must hold a bachelor's degree from a regionally accredited college and a GPA of 2.3 or higher, and profess faith in Jesus Christ. Cedarville is regionally accredited by the Higher Learning Commission. Located 12 miles southwest of downtown Dallas, DBU educates more than 5,000 undergraduate and graduate students. This Southern Baptist-affiliated institution offers Christian leadership courses online through its masters of arts in children's, Christian, family, and student ministry. These 36-credit degrees each require 18 credit hours of core courses and 18 credit hours in a specialization. Some degrees offer concentrations in special needs children's ministry or professional life coaching. Core courses include biblical servant leadership, Christian history and heritage, and spiritual formation and worship, along with a ministry mentorship. Gaining admission to a DBU graduate program requires a bachelor's degree from a regionally accredited institution, a 3.0 GPA or higher in all previous coursework, and evidence of sound moral character, consistent with the university's mission and ethos. DBU is regionally accredited by the Southern Association of Colleges and Schools (SACS). Located in Tigerville, South Carolina, just north of Greenville, the Southern Baptist institution of NGU serves more than 2,500 students in online and on-campus programs. The school offers a master of arts in Christian ministry to help students meet specific needs in the places they currently serve. Most learners take 18 months to complete the 36-credit program. Online terms last eight weeks, and on-campus terms take 16 weeks. New students can enroll at any of five start dates during each academic year. Core courses include biblical interpretation, spiritual formation, and Christian theology, along with an integration project. NGU's online pastoral degree also includes three concentration track options: church growth and revitalization, discipleship and spiritual formation, and missions and evangelism. Applicants must submit a 500-word, self-reflective essay, plus evidence of a bachelor's degree with a 2.5 GPA or higher. NGU is regionally accredited by the Southern Association of Colleges and Schools (SACS). Located in Fredericksburg, Virginia and established as a ministry of Faith Baptist Church, VBC serves graduate and undergraduate students through Christian leadership courses online. The college's 30-credit master of ministry provides advanced training to students who want to increase their biblical knowledge and ministerial skills. Each student takes 12 credits of core courses, followed by nine credits in a concentration and nine in elective courses. Core courses include systematic theology; biblical leadership in the 21st century; and discipleship, mentoring, and equipping. Students may select between five concentrations, including pastoral studies, church ministries, and missions and cross-cultural studies. Most online students take courses in eight-week modules. Applicants must hold a bachelor's degree, agree with the VBC statement of faith, and faithfully attend a local church. VBC is nationally accredited by the Transnational Association of Christian Colleges and Schools (TRACS). MVNU associates with the Church of the Nazarene and is located in Mount Vernon, Ohio, 40 miles east of Columbus. MVNU educates more than 2,200 students. Its online master of ministry equips learners with the skills to understand the biblical and historical foundations of ministry, perform pastoral tasks, and develop the leadership and communication skills needed for ministry. This 30-credit online pastoral degree includes courses such as ethical issues in ministry, contemporary theological issues, and the doctrine of holiness. Students can complete the degree entirely online, which takes about 18 months from start to finish. Applicants need a bachelor's degree with a 2.5 GPA or better for regular admission. Those with lower GPAs may qualify for probationary admission. MVNU offers new students a $5,000 scholarship, prorated as $500 per class, to help cover the cost of tuition. MVNU is regionally accredited by the Higher Learning Commission (HLC). Located about 20 miles west of Boise in Nampa, Idaho, and affiliated with the Church of the Nazarene, NNU serves more than 2,000 students. The university offers a master of arts in pastoral ministry to help equip students with the theological education needed for vocational ministry. This 40-credit online pastoral degree takes about 28 months to complete. Students take courses in eight-week terms, during which they may log into their course portals five days a week, at whatever times work for them. Students take courses such as Old Testament interpretation, pastoral leadership, and missiology and contextualization. The program concludes with a four-credit, supervised ministry course, conducted in the student's personal ministry setting. To receive an offer of regular admission, students must be at least 23 years old and have achieved a 2.5 GPA or higher in all previous coursework. NNU is regionally accredited by the Northwest Commission on Colleges and Universities (NWCCU) and nationally by the Association of Theological Schools (ATS). A school of about 750 students located in Winston-Salem, North Carolina, PIU provides graduate and undergraduate degrees on-campus and online. The university offers a 30-credit master of arts in ministry, 75% online, which enhances the ministry skills of church members and pastoral staff. Applicants need a bachelor's degree from a recognized college or university, and a 2.0 GPA or higher. Transfer applicants can bring up to 15 prior credits into the program. Once enrolled, students learn to defend the biblical worldview, preach biblically sound messages, and use modern technology for ministry. The curriculum draws from the disciplines of biblical studies, theology, ministry studies, and research. Courses include Old Testament studies, survey of theology, and teaching the Bible. The program concludes with a comprehensive exam. Students who do not pass the exam may retest once more after waiting for at least a month. PIU is nationally accredited by the Transnational Association of Christian Colleges and Schools (TRACS). Located on the oceanfront in San Diego, California, PLNU is affiliated with the Church of the Nazarene and boasts a student population of about 3,500 graduates and undergraduates. The university offers a 36-unit master's in ministry, which takes hybrid online students about two years to complete. The degree empowers Christian leaders to teach and preach, inform contemporary practice with Wesleyan theology, and better understand how to pastor the missional church. This online pastoral degree rests on four emphases: Christian formation, Christian scripture, church in mission, and Christian tradition. Each area pairs content courses with practice. Core courses include interpreting Christian scripture, Christian mission in local contexts, and Wesleyan theology and contemporary ministry. Program applicants must hold a bachelor's degree from an accredited institution, along with one year of full-time ministry experience in a local church setting. PLNU is regionally accredited by the WASC Senior College and University Commission. A college of almost 3,000 students located in Steubenville, Ohio, Franciscan's student body is 97% Catholic and claims the largest percentage of theology, catechetics, and philosophy majors of any Catholic university in the nation. Franciscan offers a master of arts in theology and Christian ministry to equip students with an authentic Catholic education in tradition, sacred scripture, and magisterial teaching. The 36-credit online pastoral degree requires 10 foundational courses, including the church in the modern world, and two core courses: Word of God, scripture and tradition; and the ecclesial nature and mission of theology. Most courses assume an asynchronous format, meaning students do not have to log on at any specific time, and each course lasts 15 weeks. Students can complete the degree in two to seven years. Program applicants do not need an academic background in theology, but must hold a bachelor's degree. Franciscan is regionally accredited by the Higher Learning Commission. Affiliated with the United Methodist Church and situated in Winfield, Kansas, near the Oklahoma border, SC offers undergraduate, graduate, and professional degrees on-campus and online. The college's online master's degree in Christian leadership focuses on youth ministry in nondenominational, Wesleyan traditions. SC's master of arts in specialized ministries requires 30 credits to complete, but transfer students may count credits from prior colleges, the military, or work or life experience. SC's courses include introduction to ministry, theology of youth ministry, and faith and formation in developing adults, along with two practicums in specialized ministry. Seven courses cover core requirements, and five courses delve into the youth ministry specialization. Each course lasts six weeks, which benefits students who want to accelerate their degrees. Applicants need a bachelor's degree to receive consideration for admission. SC is regionally accredited by the Higher Learning Commission. Affiliated with the Shadow Mountain Community Church near San Diego in El Cajon, California, SCS serves a small community of learners through ministerial education, grounded in the concept of God's inerrant word. The seminary's master of arts in Christian ministry equips lay leaders, Christians studying for personal interest, and future M.Div. students with a thorough intellectual grounding in biblical and theological principles. This 36-credit, online pastoral degree requires nine credits in biblical studies, 15 credits in interdisciplinary skills, and 12 credits in elective courses. Courses include analysis of Romans, comparative systems of theology, and critical thinking and argumentation. Applicants must write a 500-600 word essay that includes a description of their salvation experience and a statement of what they expect to receive from their time at SCS. Otherwise, the seminary considers each applicant on a case-by-case basis. SCS is nationally accredited by the Transnational Association of Christian Colleges and Schools (TRACS). Located in Circleville, Ohio, about 30 miles south of Columbus, and affiliated with the Churches of Christ in Christian Union, OCU holds a blended Wesleyan and Restorationist theological heritage. Today, the school educates about 3,300 students, including those in the online master of arts in ministry. This 36-credit online pastoral degree equips students to practice spiritual disciplines, analyze theological thinking, and demonstrate skills in practical theology and pastoral care. Courses in this program include ministry essentials, pastoral caregiver, and missions in the Western world. Students can also choose to emphasize in practical theology; pastoral care and counseling; or sports, recreation, and fitness ministries. Most courses last six weeks, except the one-credit capstone course, which lasts three weeks. Admission to the degree requires a bachelor's from a regionally accredited or ABHE-accredited institution. OCU is regionally accredited by the Higher Learning Commission (HLC) and affiliated with the Association for Biblical Higher Education (ABHE). ONU is a Church of the Nazarene institution located in Bourbonnais, Illinois, a suburb of Chicago. The university educates about 3,000 undergraduate students and 2,000 graduate students. It offers a master's in pastoral leadership, which combines theory with practice to help students deal with real-life ministry situations. This 36-credit, fully online pastoral degree provides initial graduate education to experienced pastors and church leaders. Coursework includes theology and ministry, pastoral leader as prophet, and the church as a community of formation. The curriculum concludes with an application project, called "development of a ministry plan." Accepted applicants can begin at one of three start dates during the year. Nazarene pastors can benefit from a 50% tuition reduction and qualifying non-Nazarene pastors can enjoy a 25% tuition reduction in this program. Other students can also apply for scholarships or a fellowship. A school of about 1,000 students located in the Northern California city of Redding, SU affiliates with the Christian & Missionary Alliance. The university offers an online master's degree in Christian leadership through its A.W. Tozer Theological Seminary. The master of arts in ministry leadership provides rigorous biblical training through online, hybrid, and polycom courses, which combine distance education with one-week learning experiences on-site. This degree requires 54 semester units, drawn from biblical and theological studies, ministerial leadership, experiential learning, and electives. Courses include exegetical skills using electronic biblical research; catalytic leadership; and sin, salvation, and the mission of God. Admission requires a bachelor's degree from a regionally accredited institution and a GPA of 2.5 or higher. Applicants may transfer up to half of their required credits from prior college. SU is regionally accredited by the Western Association of Schools and Colleges (WASC). Located in the heart of Nashville, Tennessee and affiliated with the Church of the Nazarene, TNU educates more than 3,200 students in undergraduate and graduate programs. Its master of organizational leadership draws from the disciplines of religion, communication, and business to provide a balanced approach to leadership. This school's online master's degree in Christian leadership requires 11 courses, including concepts of organizational leadership; cultivating networks and fundraising; and human resources, ethics, and law. Students take one course at a time, and the program's structure allows them to log on at their convenience, any time of day or night. Applicants need a bachelor's degree from an accredited institution and a GPA of 2.5 or higher, but they do not need to submit GRE or GMAT scores. TNU is regionally accredited by the Southern Association of Colleges and Schools (SACS). A private, Christian college situated in Dayton, a small city in southeast Tennessee, Bryan College serves about 1,500 students. Its online master of arts in Christian ministry equips servant leaders with biblical, theological, and practical preparation for vocational and lay ministry. Bryan offers this 36-credit program in nine-week terms, with each class presented entirely online. By taking two courses at a time, students can finish the degree in as little as 14 months. Required courses include New Testament literature and interpretation, Christian theology, Christian worldview, and history of Christianity. Since the program allows several electives, learners may choose to emphasize either administration or Bible education. Faculty members teach all courses from a Christian worldview. New students can begin the program at one of seven start dates during each year. Bryan is regionally accredited by the Southern Association of Colleges and Schools (SACS). Located in Winona Lake, a borough in north central Indiana, Grace College holds a historical affiliation with the Fellowship of Grace Brethren Churches; however, the institution welcomes an interdenominational student body. Grace offers a 36-credit, fully online master of arts in ministry studies to help prepare students for vocational ministry. By taking a new course every eight weeks, students can complete the program in six terms, or two years. Required courses include Bible study methods, historical development of doctrine, and ministry and cultural diversity. These courses operate asynchronously, meaning students log in according to their own schedules; however, the program aims to build a community of learners. Students may choose to specialize in counseling, camp administration, or women's leadership. Camp administration includes an 11-month internship at Forest Springs Camp and Conference Center. Future Grace students must hold a bachelor's degree from an accredited institution. Grace is regionally accredited by the Higher Learning Commission (HLC). Affiliated with Grace Gospel Fellowship, a dispensational Evangelical movement, GCU is located in Wyoming, Michigan, a suburb of Grand Rapids, and serves just under 1,000 students. The university offers a master of arts in ministry -- a fully online, 36-credit program that improves students' biblical and theological knowledge, along with their practical ministry skills. Courses include communicating for transformation, practical application of Pauline theology, and studies in dispensational theology. The program concludes with a thesis, which must contain a biblical, theological, and practical component. Students can expect to graduate from this online pastoral degree in about 20 months. Applicants must submit undergraduate transcripts, two references, and a writing sample that demonstrates capacity for graduate-level study. Typically, Grace needs all application materials three weeks before the student's proposed start date. Grace is regionally accredited by the Higher Learning Commission (HLC) and nationally accredited by the Association for Biblical Higher Education (ABHE). Affiliated with the Churches of Christ and located in Abilene, Texas, Abilene Christian University (ACU) serves more than 5,000 students. The university offers a master's in Christian ministry, an online pastoral degree that enhances the leadership skills of church staff and education and social services professionals. Students learn the history of Christianity, knowledge and skills for ministry, and how to integrate theology into concrete ministry situations. Courses in this 48-credit degree include history of Christianity, systematic theology, and foundations of the theology of ministry. Students also choose a concentration such as student and family ministry, spiritual formation, ministerial leadership, and ministry and Bible. The program takes about 2.5 years to complete. Applicants need an undergraduate degree from an accredited school. Grace is regionally accredited by the Southern Association of Colleges and Schools (SACS) and nationally by the Association of Theological Schools (ATS). A nondenominational school of about 650 students located in Portland, Oregon, MU offers bachelor's, master's, and doctorate degrees. The university's two-year master of arts in Christian leadership enhances the capacity of professionals working in church and parachurch ministry settings. This online master's degree in Christian leadership emphasizes a missional, spirit-driven perspective on organizational change. Applicants must hold a bachelor's degree from an accredited school, and a 2.5 GPA or higher. Once enrolled, students take courses such as principles of spiritual formation, Christian theology I and II, and theology of community and ministry. The program concludes with a mentored ministry component. Students can devote their electives to a concentration track such as spiritual formation, pastoral leadership, or global development and justice. MU is regionally accredited by the Northwest Commission on Colleges and Universities (NWCCU) and nationally accredited by the Association of Theological Schools (ATS). Located in Cromwell, Connecticut, Holy Apostles maintains a strong Catholic identity devoted to forming priests, lay leaders, and religious sisters. The seminary's master's in pastoral studies helps prepare lay and ecclesial leaders for service, especially in parish settings. Admission requires a bachelor's degree and a 3.0 undergraduate GPA. Once enrolled in this online pastoral degree, students take courses in mission and evangelization, Catholic social teaching, and nurturing the domestic church: fostering authentic marriage and family life and spirituality. Students may also choose between six concentration options, including pastoral counseling, spiritual direction, and youth and young adult ministry. The program concludes with a special capstone project or comprehensive exam. To graduate, students must complete 36 credits and hold a GPA of at least 3.0. Holy Apostles is regionally accredited by the New England Commission on Higher Education (NECHE) and nationally by the Association of Theological Schools (ATS). A school of about 5,600 students located in Western St. Louis County, Missouri Baptist University (MBU) provides an online pastoral degree to equip full-time ministers, missionaries, and lay leaders with the practical and theological skills to further the Kingdom of God. The master of arts in Christian ministry comprises 39 credits, including 24 credits in core courses, 12 in pastoral ministry, and a three-credit internship or project. Core courses include history of Christian thought I and II, spiritual formation, and knowing God. Specialization courses include principles of pastoral ministry and expository biblical ministry. Students can also study biblical languages, counseling, and apologetics -- among other subjects -- on-campus. Admission requires a bachelor's degree, and the program takes about 24 months to complete. For some learners, MBU's online pastoral degree serves as a bridge to an M.Div. program. MBU is regionally accredited by the Higher Learning Commission. An independent, non denominational school in Grand Rapids, Michigan, Cornerstone consists of undergraduate and graduate schools, two seminaries, and a radio division. The university offers a master of arts in ministry leadership to help students deepen their biblical knowledge, advance their theological development, and sharpen their skills in practical ministry. Applicants need a bachelor's degree from an accredited institution, and a 2.5 GPA or higher. Once enrolled in this online master's degree in Christian leadership, students join a cohort of 12-15 other learners, and take courses in 15-week semesters. The curriculum divides between six core classes and six electives. Courses include biblical hermeneutics, New Testament biblical theology, organizational leadership, and global impact. Learners can finish the 36-credit program in just two years by taking two courses per semester. The degree does not form a basis for doctoral study, but students may use it to bridge to an M.Div. or other seminary degree. Cornerstone is regionally accredited by the Higher Learning Commission. Situated in Honolulu's historic Kaimuki district, Chaminade is a Roman Catholic institution in the Marianist tradition, educating just under 3,000 students. The university's master of pastoral theology prepares students for active ministry through theological reflection. This online pastoral degree requires 36 credits, provided students have earned all the necessary prerequisite credits. Courses include code of canon law, sacramental theology and practice, and Catholic social teaching. Upon graduating from the program, students should understand Catholic theology within a Vatican II framework and the Marianist educational tradition. They should also boast the capacity to compare and contrast theologies, and apply theological reflection in pastoral contexts in Asian and Hawaiian settings. Applicants need a bachelor's degree with a cumulative GPA of 2.5 or higher, and excellent English skills. Chaminade is regionally accredited by the Western Association of Schools and Colleges (WASC). Students considering an online master's degree in Christian leadership can expect an immersive and comprehensive plan of study that exposes them to topics within Christianity and church membership. In the program offered by Grand Canyon University, degree seekers study topics such as ministerial ethics, biblical hermeneutics, Old and New Testament foundations, and best practices in Christian leadership. Upon completion of a program, many graduates become junior pastors or take up administrative roles in churches. Others may decide to plant their own churches in an underserved area. Because Christian leadership serves as an umbrella term covering a large field, many programs allow learners to focus their degrees in a concentration area. While these vary by school, options include organizational management, music ministry, youth ministry, systematic theology, and audio/visual ministry. These programs help students tailor their studies to future ministry opportunities. Depending on the program, some students may complete an internship at a church as part of graduation requirements, while others may undertake a research project or thesis. What Else Can I Expect From an Online Master's in Ministry and Pastoral Leadership Program? When reviewing online pastoral degrees, prospective students will notice programs vary by institution. Common classes and concentrations are highlighted below, but students should research individual programs to find out exactly what courses are offered. These programs appeal to individuals with musical talents who want to use them to glorify God. Learners study Christian songs, band techniques, choir logistics, and sometimes specific instruments. Students who select this concentration often have a heart for international missions. The program covers topics such as intercultural communications, respecting cultures, preaching, discipleship, and how to organize effective and appropriate mission trips. Family ministry programs help individuals who want to work with singles and couples ministries, youth programs, Sunday School, and small groups develop the tools needed to minister to these groups, provide appropriate materials, and encourage development of faith. This course addresses some of the common pitfalls of both new churches and established ministries. It provides an overview of how Christian leaders can properly manage finances, create attainable goals, and set appropriate boundaries. Students in this class look at both secular and biblical leadership models as a way of understanding the theories behind each. They then take part in role-playing activities to understand the pros and cons of each. This course helps students understand some of the common issues surrounding Christian ethics and looks at how Christian leadership should behave. Other topics include self-care and shepherding diverse populations. While all pastors hope to avoid difficult situations in their churches, the reality is that sometimes these arise. This course helps them understand how to diffuse conflict and mediate between leaders and congregants. This class provides learners with a refresher on the themes and historical context of the Old Testament, with the goal of helping them interpret the Bible correctly to share with their congregations. Online ministry degree paths prepare students for a variety of roles related to leading a church or faith-based organization. Most are tasked with traditional responsibilities such as leadership, finances, or education but fulfill their duties in accordance with their denominational faith. Members of the Clergy: Regardless of denomination, members of the clergy act as spiritual leaders within the church and convey messages from the Bible to their congregations. Some may work as head pastors while others may focus their efforts on youth ministry or music. They may also lead Sunday School and small group meetings. Religious Activities & Education Directors: These professionals coordinate extracurricular activities at the church and encourage participation from members and visitors. They may oversee the annual Christmas outreach program, develop Vacation Bible Camp in the summer, or oversee counseling programs at the church. Other Religious Workers: This category serves as an umbrella term for other employees of the church and can include administrative staff, janitors, pianists and organists, personal assistants, finance directors, or anyone else who helps keep the church running smoothly.